Area : 3,42,239 sq km. Languages : Rajasthani, Hindi, English & others. Temperature : Max. 41° C and Min. 16° C in summer.Max. 17° C and Min. 5° C in winter. Religion : Hindu, Muslim, Christian and others. Rajasthan is located in the western side of India. The magical land set amidst the desolate desert beauty. Immensely rich in culture, history and natural beauty. 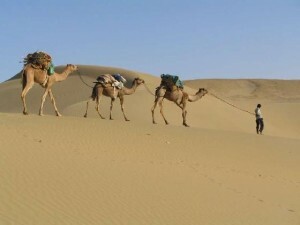 Rajasthan is a land where the vagaries of nature have settled to co-exist with the good cheer of its people. The architectural grandeur of royalty and the tales of valour and chivalry are the essence of its very spirit. The mountainous Aravalis and Vindhyas on the one hand and the desert landscape on the other form a contrast which blends perfectly with the history of Rajasthan. “The remarkable lifestyle of its inhabitants is seeped in an age-old tradition that has been zealously guarded by the people against all aberrations, despite the invasion of modernity.” Everything about Rajasthan fascinates from miles of golden stretches of sand to magnificent forts, opulent palaces and havelis, each a splendid architectural creation having a legend of its own. Many beautiful temples dating back over centuries dot the entire state, making it a popular pilgrim spot for people. Even for wildlife enthusiasts, the state is an excellent retreat with its arid zone of the Thar desert and the dry deciduous forests that offer a rich variety of flora and fauna. Some of the finest national park and sanctuaries are found here. The land comes alive with exuberant folk dances and music. Rajasthan is also renowned for exquisite miniature paintings and frescoes. Rajasthan is a destination that enchants the visitor with every little discovery that is made, because the more one discovers, the more is the urge to stay on or come back. The land comes alive with folk dances and music , ballads and spectacular festivities that and are inseparable part of Rajashthan’s culture. Air: Rajasthan is well connected by Air. Regular flight services are available to reach Jaipur from various parts of the country. Sanganer airport is only 15 km away from Jaipur town. Rail: Jaipur is also connected by Rail with different parts of the country. Road: Good memorable road connect Jaipur to many other parts of the country. It is located on NH No.8 and 11. Regular buses ply form Jaipur to the said parts of the country. Travel Spot: Abhaneri, Dholpur, Karauli, Pushkar Lake, Ajmer, Dilwara, Keshoraipatan, Ramgarh, Alwar, Dungarpur, Khatu Shyamji, Ranakpur, Amber, Eklingji, Khwaja Sharif, Ranthambhor, Amer, Haldighati, Kiradu, Rikhabdeo, Arthuna, Hanumangarh, Kishangarh, Sam, Baghera,Jaipur, Kolayat, Sambhar, Bagru, Jaisalmer, Kota, Sanganer, Banswara, Kumbhalgarh, Sawai Madhopur, Barmer, Jaisamand, Lohargal, Shekhawati, Bayana, Jalore, Mehrangarh, Shri Mahavirji, Bhainsrodgarh, Jhalarpatan, Menal, Sikar, Bijolia, Jhalawar, Merta, Siliserh, Bikaner, Jhunjhunu, Mount Abu, Sitabari, Bundi, Jodhpur, Nagaur, Sojat, Chhittaurgarh, Junagarh, Nakki Lake, Tijara, Churu, Kaila Devi, Nathdwara, Toda Rai Singh, City Palace, Kakod, Osiyan, Tonk, Deeg, Kakuni, Pali, Udaipur, Deshnok, Kalibanga, Pushkar. This entry was posted in Rajasthan and tagged rajasthan district, rajasthan images, rajasthan photo, rajasthan photos, rajasthan pictures, rajasthan state, rajasthan tour, rajasthan tourism, rajasthan tours, state of rajasthan, visit rajasthan. Bookmark the permalink.